UK Export Finance helps military vehicle manufacturer access finance to fulfil a contract with the Australian government. Honiton-based SC Group is renowned for its three decades of engineering design success. 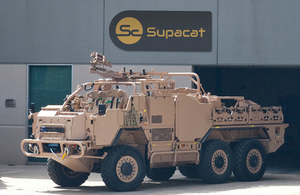 When Supacat, its military vehicle manufacturing arm, won a significant contract to provide special operations vehicles for the Australian Government, it received a £10 million advance payment to support its working capital in fulfilling the order. In return the buyer asked for an advance payment guarantee from SC Group’s bank, RBS. Due to the size of the order, RBS required additional security to issue the guarantee, which would have restricted Supacat’s working capital. UKEF’s bond support scheme enabled SC Group to access the banking facility without affecting the working capital required to fulfil the order. Without UKEF’s support, we would have had difficulty financing this contract. Working with RBS and UKEF meant that we were able to access the finance we needed to sell to Australia and as a result, significantly increase our revenue.